In the days of one computer per household, last-click measurement made a lot of sense. Now that consumers shift constantly between devices, cross-environment measurement is a must. 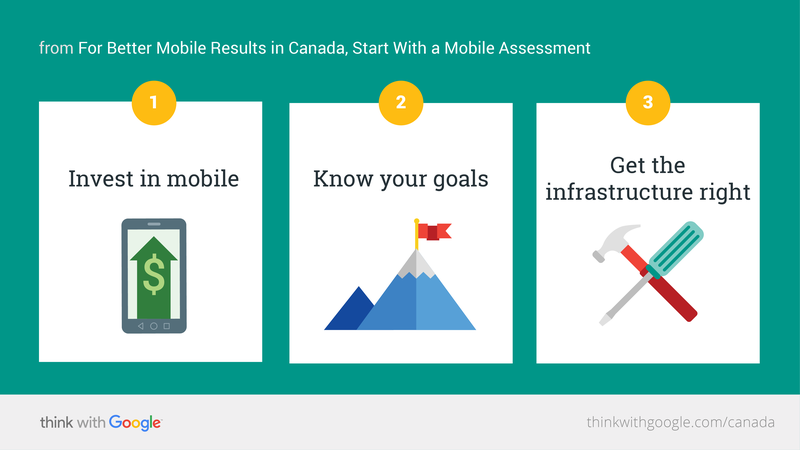 Conducting a mobile assessment is a great place to start capturing the true return on your media investments. Those numbers point to big opportunities for marketers, but mobile strategies aren't one-size-fits-all. Mobile numbers vary widely by industry—what works for a big bank may not work for a chain of car dealerships. That may leave marketers unsure of how much to invest in mobile. A mobile assessment—performed with the help of a DoubleClick representative—can give marketers a clear view of mobile usage for their industry and business so they can make smart budget choices. The rising tide of mobile usage is creating a lot of data that can help you determine the best ways to allocate your marketing budget. As you're sorting through all the data available to you, one of your key focuses should be customer behaviour across devices: mobile-only unique visits, desktop-only unique visits, and cross-platform unique visits. There are several different ways you can get at these data. As a first step, study your own website analytics to see how consumers interact with your brand (these best practices from DoubleClick can help you get started). You can also get a feel for how consumers more generally are turning to mobile by reading up on the latest trends. When we conduct a mobile assessment for marketers, DoubleClick can combine its extensive data with the data you have on hand with numbers from sources like comScore's Media Trend analysis, which looks across sites, publishers, and industries going back more than a year. 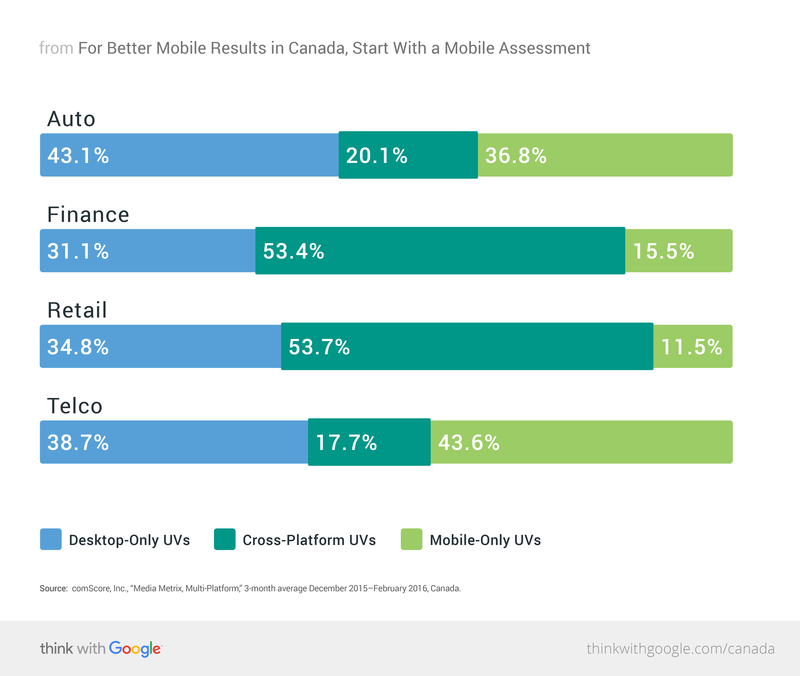 This can give you a well-rounded view of the mobile landscape in your industry so you have something to benchmark your budget against. As an example, here's comScore4 data showing the variations in unique visits from four industries: automotive, financial services, retail, and telcos. In finance and retail, more than half of all consumers make use of both desktop and mobile devices, while telcos have the smallest cross-platform segment of this group―only about 18%. Yet the mobile-only segment for telcos is the largest at about 44%. Naturally, if you see that consumers in your industry skew toward mobile or desktop, you can adjust your budget accordingly. If your telco brand is seeing most of its traffic from desktop alone, for example, it would be worth looking into your mobile investments and seeing how you could reach customers who are eager to engage on mobile. You’ll want to start with a baseline as you measure the key indicators for your business, and DoubleClick can help you create a plan for that as well. As you look to measure across environments, here are new best practices. 1. Invest in mobile. Mobile won't happen by itself. It takes a team effort, a commitment to mobile-friendly formats, and investment in things like HTML5 creatives. 2. Know your goals. Your "road map" of cross-device data won't help you much if you don't know the destination you want to reach. Is your goal more direct sales? Better brand recognition? Make your KPIs clear before you start, then check in as you measure. 3. Get the infrastructure right. Make sure your mobile and desktop systems (and teams) are working together. Add Floodlight tags to your sites and apps, and make sure you're ready to measure cross-environment conversions. Mobile now accounts for 56% of time spent on digital,5 so if you're waiting for the tipping point, it's already happened. It's time to start treating mobile and cross-environment activity as the default, and then budget accordingly. Conducting a full assessment of mobile and cross-environment activity with your digital media team is now a necessity. A holistic view of your business and your industry as a whole will help you measure the effectiveness of your mobile investment and learn what kind of digital spend makes sense for your business. 1 Mitek and Zogby Analytics, September 2014. 2 YouTube Statistics, based on YouTube internal data. 3 comScore, Inc., “Media Metrix Multi-Platform,” monthly Q4 avg, 2015, Canada, Total Audience. 4 comScore, Inc., “Media Metrix, Multi-Platform,” 3-month average December 2015–February 2016, Canada. 5 comScore, Inc., “Media Metrix, Multi-Platform,” August 2015, Canada.